I have six adult chickens and six chicks. One of the chicks is free ranging with her mum and has been since she was four weeks old. Mum does a good job at looking after her. But my five chicks that were hatched in an incubator don’t have a mum to protect them from the big girls but I wanted them to have plenty of space to run around in. I went online and here is the answer to my problem. 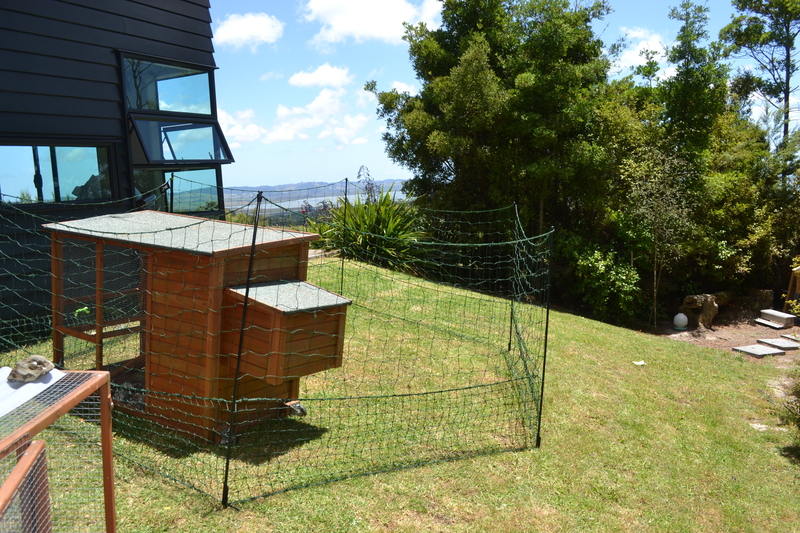 It is Omlet temporary chicken fencing, now available in New Zealand. It is easy to put up (once you know how) and is easy enough for one person to move when the chicks need fresh grass every few days. The chicks have been using this fencing now for about four weeks with no problems. I was a bit worried to start with that they might tangle themselves in it or the big girls might fly over into it but of course that didn’t happen. Just me being a worrier when I am at work all day, leaving the chicks and chickens to their own devices. I would be careful though if you had dogs or predators around. This is definitely not a predator proof fencing but a temporary chicken fencing. We are lucky here in New Zealand that we are essentially predator free and I do not have dogs that come onto my property (touch wood but not so far in four years of having free range chickens). Read the reviews if you are unsure before you buy this fencing. This allows my chicks to be amongst the rest of the chickens, meaning I should have less problems integrating them once I decide they are big enough to take the fencing down to join the rest of the flock. Categories: Chicks | Tags: chicken, Chickens | Permalink. I had a call tonight from the wonderful new owners of Hannah-Hen’s chicks. He had some good news and some bad news. He sent me some pictures of the chicks in their new home. Look at that wonderful garden. What a perfect haven for them. Firstly the good news. Hazel (aka Becky) with the little curled toe went broody and her first chick from her clutch of eggs she is sitting on, hatched today! I am so excited and happy for her. That is such wonderful news. What a lucky we bantam. Secondly the bad news. Also today, a note was left at the door of the house where these lucky chickens live. The note was from the city council (yes these wonderful new owners live in Auckland City, New Zealand). The note said they had two days to get rid of the rooster. Yes, I know and so do the wonderful new owners know, that they were defying the council rules having a rooster in their yard but they did check with all of their immediate neighbours first and the neighbours were perfectly fine about a rooster living next door. There are other roosters in the neighbourhood in this part of Auckland city. I wonder if they got notes on their doors as well. So if anyone knows of anyone in New Zealand who would like a partridge wyandotte bantam rooster named Harry, please let me know. He is a beautiful nature and a real gentleman with his girls. And in case you were wondering about Howie, Harry’s brother, he went to a farm just after they went to live with their wonderful new owners. 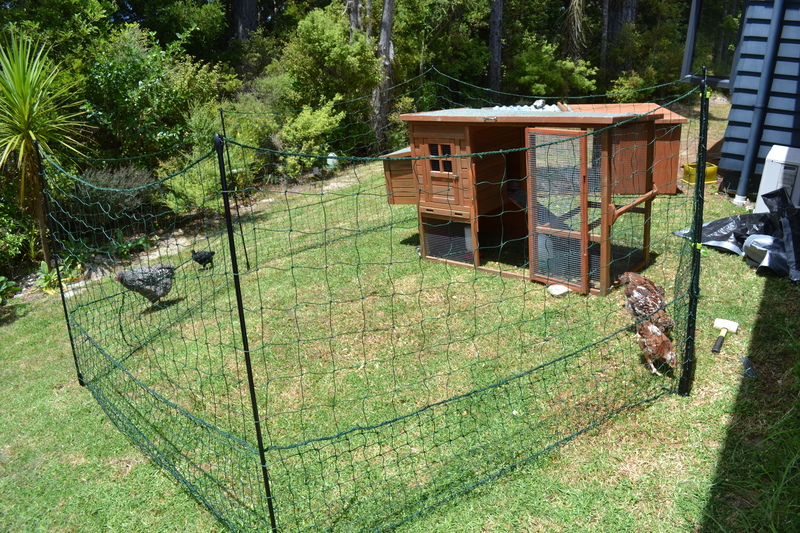 Categories: Chicks | Tags: Chickens, Chicks, Chooks, Hens, Rooster | Permalink. Did I find a new home for my rooster and hen chicks? A few weeks ago, my husband told me that the roosters were waking him up too early and that they had to go. That was the deal when we agreed to hatch chickens but I wasn’t quite ready for them to go. I guess I would never be quite ready. I have loved being part of the chicken hatching process. I have loved watching the mother hen protect her babies. I have loved watching the chicks grow. I have loved watching how the chicks coped with the mean Helen Hen. I have loved (and horrified at the same time) watching mother hen abandon her chicks. I have loved watching the chicks become part of the main brood. I have loved hearing the roosters crow. I have loved watching the chicks making their decision of when to sleep with the big girls. I have loved watching the girls mature. But nevertheless, two weeks ago I advertised my chicks on Trademe website, which is New Zealand’s equivalent to Ebay. I advertised them as two pair, Howie and Harry Hen-Boys, and Hedvig and Harriett Hen-Chicks. I would keep Hazel Hen-Chick (with the curled toe). Neither of the pairs sold that first week so I took this as a sign that they should stay with me , but my husband had other ideas. So the chicks were relisted on Trademe for one more week. We agreed if they didn’t sell that week, I would “get rid” of the roosters the following weekend and keep the girls until they started to lay. At the end of that second week on Trademe, both pairs of chicks sold. Huge mixed emotions! But after meeting the people who bought them, I couldn’t have been happier. I couldn’t have chosen a better home for my chicks. They will be loved and they are all together. I decided that because the four chicks were going to the one home, I felt it was nicer for Hazel Hen-Chick to go with her brothers and sisters. And I had the most amazing surprise the day before the chicks left for their new home. Two of the girls laid their first egg for me. What a generous gift. Is my five and a half month partridge wyandotte chick ready to lay? I just happened to look out the window this morning and there was my five and half month old chick moving with a sense of purpose towards the chicken coop. It is mid morning and the sparrows had probably finished off the chicken’s food that I had put out so I was watching to see if she would find anything to eat. But no. With the same sense of purpose, she strode past the feed dish and into the chicken house. The only thing I can think of is that she went in there to sit on a nest. Perhaps she is going to lay her first egg. How very exciting. I watched out the window for a few minutes to see if she came straight back out, but no. She stayed in there. What a shame I have to go out soon and I won’t be there when she comes out. But then maybe she is just familiarising herself with the process and she is not anywhere near ready to lay. Categories: Chicks | Tags: Chickens, Chicks, Eggs | Permalink. My chicks have finally integrated during the day with the big girls. Helen still chases the little girls when she feels like being mean but the majority of the time, they peck and scratch and wander happily together. The little girls still keep away from the big girls at feed time but at least they are allowed to peck at the treats in the same vicinity without being harassed too much. So the only thing stopping my chicks and chickens from being a fully integrated brood, was that they sleep in separate coops. The plan was to leave them in separate coops until I sell the two boys and two of the girls in a month or so and then to integrate Hazel Hen-Chick in the big girls coop. Last night I went outside as usual to shut the chicks and the chickens in their respective coops. Hedvig Hen-Chick was standing in the chick coop and didn’t seem to want to go inside the chick house. I shut the coop door anyway and then walked over to the big girls coop and shut their door. I looked back over at the chick’s coop and there she was, still standing in the coop, not wanting to go into the house. So I walked over to her to see what was wrong. Hmmm, that’s strange, there was no sound coming from the chick’s house. The chicks are usually very noisy as they jostle for position before settling down for the night. So I lifted the roof of the chick’s house and I got such a shock! It was empty. Hedvig was the only chick in the coop. No wonder she was unsettled. Where on earth can the rest of the chicks be. It is past their bedtime and starting to get dark, so something must be wrong. I walked around in a bit of a panic to look for the rest of the chicks. As I walked past the big girl’s house, I heard a noise. The chicks sounded as though they were jostling for position in the big girl’s coop! I peeped in and there they were. All of the chicks were snuggled together (minus Hedvig) on the floor. So I went over to the chick’s coop and opened the door. Hedvig came running out and went over to the big girls house but seemed unsure. I managed to manoeuvre her towards the door of the coop and gently shooed her in. Once I shut the door behind her she looked at me as if to say, now what! I stood and watched her as she tentatively walked towards the ramp and looked into the house. She must have seen her brothers and sisters because she stepped onto the ramp and slowly made her way up and into the big girls’s house. The chicks welcomed her in and she snuggled down with the rest of the chicks for the night. Tonight they all went into the big girl’s house to sleep. Hannah Hen is not terribly happy and she chases them out. They all come running out into the run and wait for Hannah to settle herself once again and off they go again, up the ramp and into the nice warm corner of the house, as far from Hannah as they can but at the same time being careful not to go too near Helen. I have no idea why the chicks decided to sleep in the same coop as the big girls. I have no idea if this is normal behaviour or not. But I am very pleased. Categories: Chicks | Tags: Chickens, Chicks, Chooks, coop, Hens | Permalink.